National Tax Manager has developed a range of Plain English tax guides and training services to help you comply with GST, PAYG, FBT, pay-roll tax, superannuation, the BAS and many more taxes. Our range of services may be ordered individually (see How to Order) or as a bundle (refer Discounts). Please spend some time now perusing our products range. All our prices are GST inclusive. All employers need to comply with the ever-changing tax laws. This 145 page guide explains in plain English an employer’s obligations in respect of PAYG withholding and instalments, ETPs (Eligible Termination Payments), Payment Summaries, Payroll Tax, Fringe Benefits Tax (FBT), Superannuation, FID, debits tax, land tax and other taxes. Updates for 6 months are included in your subscription and a $132 (incl. GST) renewal fee applies after 6 months. Bonus. Subscribers to our products also receive our weekly tax email broadcast keeping you up to date with tax as it happens. Extra value of $132 for subscribers only. One of the most difficult taxes is Fringe Benefits Tax (FBT). If you provide your employees private use of a car, pay their private bills, pay for subscriptions or provide discounts, you need to know the FBT rules. Also, with the introduction of GST, the FBT rules are now that more complex. Our 150 page plain English FBT guide identifies all fringe benefits, shows how to calculate FBT and reduce any tax liability. It also discusses salary packaging and the (complex) relationship between FBT and GST. Updates for 12months included. 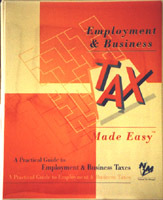 We complement our tax guides with training. During February 2004 we are providing half day training sessions concentrating on FBT and salary packaging. No employer should miss this training – ideal for your accounts personnel, payroll officer or office manager. For more information and to register, refer to Tax Training. We are able to provide you advice on most tax matters, particularly GST, PAYG, FBT or the BAS. Our consulting rates are very reasonable (about $220/hr incl. GST). Contact Anton Gaudry on (03) 9500 8182 or at anton@taxmadeeasy.com.au for a quote.